Det er endelig lykkedes os at få fat på The Roy Orbison Story Show fra England. Barry Steel er fantastisk som ”original” Roy Orbison. · Mini stjerneskud med stegte rødspættefileter, rejer og frisk asparges. The only show in the U.K. authorised by the late Barbara Orbison and Orbison enterprises. 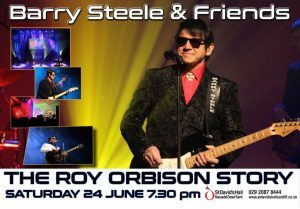 Barry Steele is widely recognised as one of the world’s leading vocalists playing homage to legend Roy Orbison. He has stunned audiences across the globe with his uncanny ability to authentically revive the exquisite toe-tapping sound of this musical legend. Barry Steele and Friends are proud to present their new show for 2018, as they not only celebrate the 30th anniversary of the conception of the Traveling Wilburys, but commemorate the 30 years since The Big O passed away. Many artistes over the years have either worked with or paid tribute to the legendary Roy Orbison, and the production observes not only the musical legacy of The Big O and The Traveling Wilburys, but also features chart busting hits originally performed made famous by George Harrison, Chris Isaak, The Spencer Davis Group, Jeff Lynne, Del Shannon and of course the Big O, all backed by a big screen and phenomenally talented musicians culminating in an incredible fusion of ‘60s solid gold classics and ‘80s contemporary musical genius all on one stage. (Sponsorat giver bl. a. ret til gunstig forudbestilling og reservation af billetter).